Fabulous 4 Corners Icebreaker | 4 Times the Fun! One of our favorites is the Fabulous 4 Corners icebreaker! This icebreaker allows participants to get up and move, meet new people, and laugh hard! Being able to use unlimited topics means this activity never gets dull. We’ve used it at multiple retreats and have always been able to keep it fresh with new topics. Announce four topics, one for each ‘corner’, and have each lady go to the topic corner that best fits her. When all of the ladies have had a chance to get to a corner, give them a subtopic to discuss among themselves. Below are some examples, but feel free to make up your own. We always give the ladies several minutes so that everyone has a chance to introduce themselves and talk about the sub-topic. Fill out the form below and get a free printable of these topics and subtopics plus scriptures and other resources for more icebreakers! Subtopic: Share daily morning habits (how much soda, coffee, etc?). Subtopic: Which specific movie is your favorite? Subtopic: Share a favorite sporting event memory. Subtopic: Share your favorite place to get ice cream. Subtopic: Have you ever traveled overseas and eaten your favorite cuisine there? Share. Subtopic: Share a funny or frustrating housecleaning story. Subtopic: Share a time you received your favorite flower. Subtopic: Share specifics about why you chose your favorite season. Subtopic: Share a favorite holiday memory. Subtopic: What feelings do your favorite color evoke? Subtopic: Share a favorite vacation memory. Subtopic: What’s the first thing you’d do as superhero? Subtopic: When was the last time you had a day to yourself? Big adventure: skydiving, surf boarding, bungee jumping, zip lining. 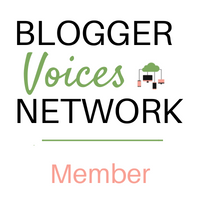 Subtopic: Have you been on your big adventure? Share. If not, do you plan to? You can have as many rounds as you have time for. We usually do no more than 3 rounds; it depends on the size of the groups. When finished, either have the ladies sit with the group they ended with (that keeps them mixed up so they can get to know more people) or let them go back to their original seats. 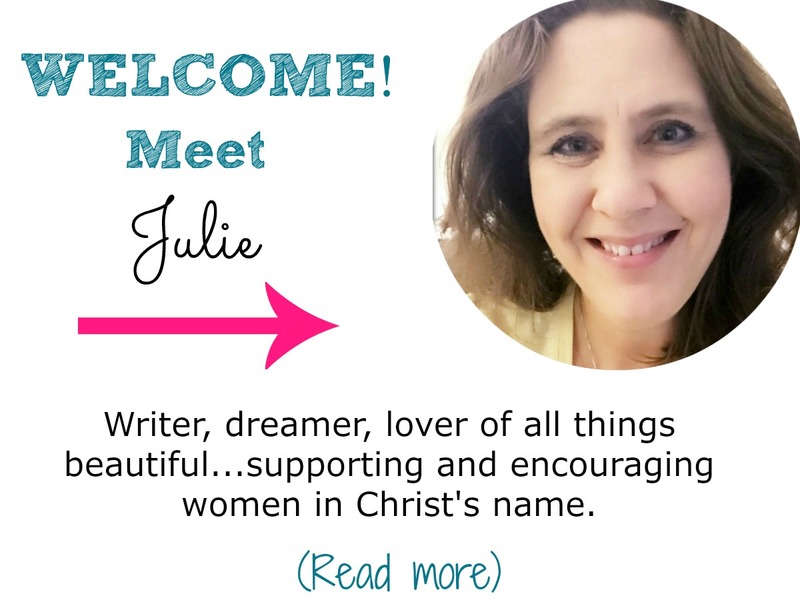 **Be sure and check out Icebreaker: Four Corners from Women’s Ministry Toolbox, too! Want to remember this? 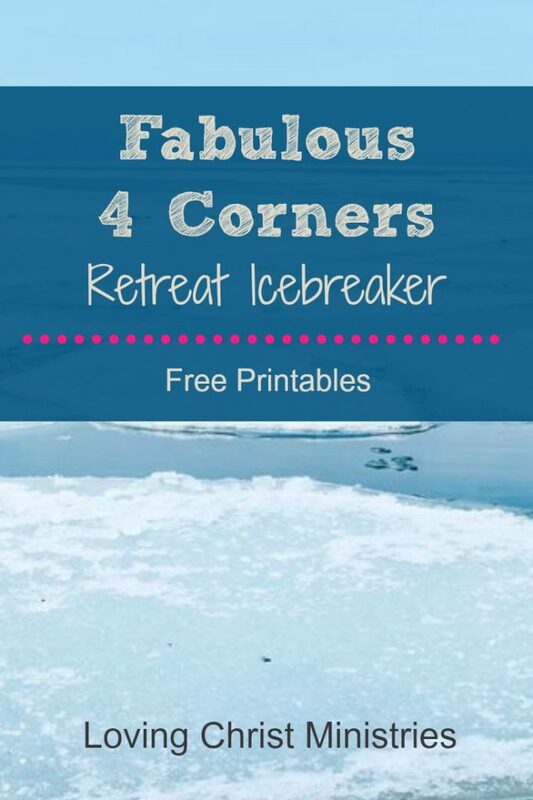 Post this Fabulous 4 Corners Icebreaker to your favorite Pinterest board! « How Do We Love Our Neighbor As Ourselves if We Don’t Love Ourselves? Belinda, I’m so happy it worked out well for you all! Wasn’t it fun! We love it, too! This was so helpful. Thanks for sharing! Allyson, I hope you get a chance to try it out. So much fun!